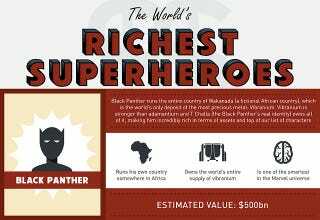 All hail comics' most wealthy: Black Panther. Buddy Loans created the infographic below from a bunch of sources including Forbes, Wikipedia, and Comic Vine. I never thought that his comparatively low wealth would be a reason to feel bad for Magneto. Now, while fun, there are a few problems that jump out immediately: A) it misspells Wakanda and B) it says "Richest Superheroes" when it also includes villains. Beyond that, it's pretty great.